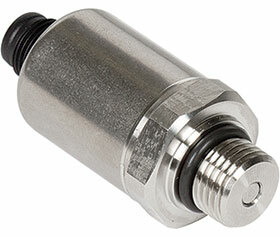 Turck has extended its line of PT2000 pressure transmitters with the release of a variant for use in hydraulic systems. The SAE #4 and SAE #6 process connections are particularly important, as they are commonly used for hydraulic equipment in North America. The new transmitters, which offer a welded stainless steel measuring cell for increased durability and increased chemical compatibility, have no elastomer seals and all wetted materials are 316L stainless steel. Additionally, the housing is more compact than existing solutions, suiting it for applications with space constraints. The transmitters are available in multiple pre-scaled pressure ranges from 2 to 1000 bar. The new variant also offers multiple output signals allowing the sensor to adapt to existing control circuitry including 4-20 mA, 0-10 V, ratiometric, 1-6 V, and 0-5 V. Additionally, it carries an IP67 rating and works with media temperatures up to 135°C.